Created by Daniel Pistelli. Rebel.NET is a rebuilding tool for .NET assemblies which is capable of adding and replacing methods and streams. To read the complete Rebel.NET guide, click here. It’s possible to replace only a limited number of methods or every method contained in a .NET assembly. The simplicity of Rebel.NET consists in the replacing process: one can choose what to replace. For instance, one may choose to replace only the method code, instead of its signature or method header. The interface of Rebel.NET is quite a simple one. As input it requires a .NET assembly to be rebuilded and a Rebel.NET rebuilding file. The Rebel.NET file contains the data that has to be replaced in the original assembly. 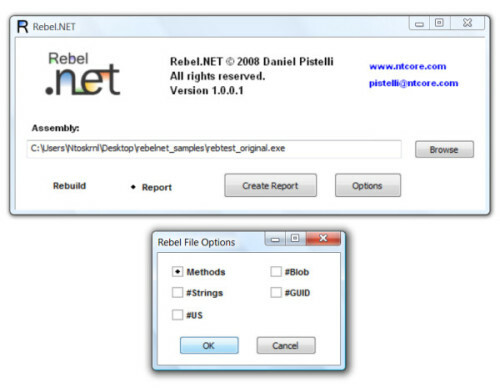 Rebel.NET can also create a Rebel.NET file from a given assembly. This is a key functionality, since some times the data of the original assembly has to be processed first to produce a Rebel.NET file for the rebuilding of the assembly. This sort of “report” feature can also be used to analyze the methods of an assembly, since reading the original data from a .NET assembly isn’t as easy as reading a Rebel.NET file. It’s possible to choose what should be contained in the Rebel.NET file. All the Rebel.NET features can used through command line, which comes very handy when an automated rebuilding process is needed. Rebel.NET is, mainly, a very solid base to overcome every .NET protection and to re-create a fully decompilable .NET assembly. As such, Rebel.NET has to be considered a research project, not an encouragement to violate licensing terms.